“When the [Union League] met in Washington early in December , there was more than a little possibility that it would seek to dominate the coming presidential election. In New York, John Austin Stevens was working diligently to transform the powerful club there into a Chase society. 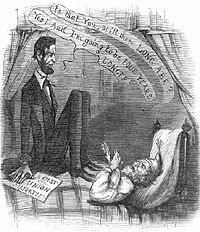 Thurlow Weed discovered, or at least suspected, that the ‘Loyal Leagues…are fixing to control delegate appointments for Mr. Chase.’ The radical tendencies of the league had become well known, and it was generally felt that the meeting would be the signal for a general attack on Lincoln and his policies. 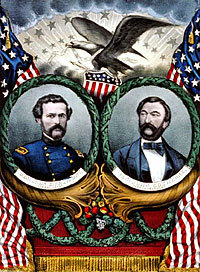 The situation in New York was complicated by the nomination of John C. Fremont for President on a ticket with former New York congressman John Cochrane as his vice presidential running mate. Welles returned to his complaints about New York on October 13: “The President is greatly importuned and pressed by cunning intrigues just at this time. Thurlow Weed and Raymond are abusing his confidence and good nature badly. Hay says they are annoying the President sadly. This he tells Mr. Fox, who informs me. They want, Hay says, to control the Navy Yard but dislike to come to me, for I give them no favorable response. 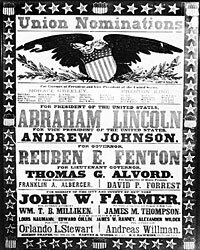 They claim that every mechanic or laborer who does not support the Administration should be turned out of employment.”17 Prospects of employment, patronage and victory seemed to pull the New York Republican Party together. Michael Burlingame, editor, “Lincoln’s Humor” and Other Essays of Benjamin Thomas, p. 13. 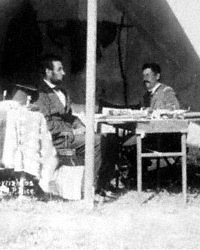 Michael Burlingame and John R. Turner Ettlinger, editor, Inside Lincoln’s White House: The Complete Civil War Diary of John Hay, p. 104 (October 30, 1863). 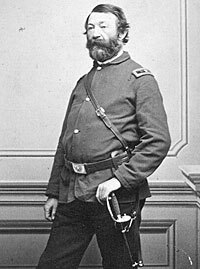 Ernest A. McKay, The Civil War and New York City, p. 235-236. William Frank Zornow, Lincoln & the Party Divided, p. 32-33. James M. Trietsch, The Printer and the Prince, p. 275. Gideon Welles, Diary of Gideon Welles, Volume I, p. 521 (February 2, 1864). Gideon Welles, Diary of Gideon Welles, Volume II, p. 28-29 (May 11, 1864). Gideon Welles, Diary of Gideon Welles, Volume II, p. 43 (June 1, 1864). Gideon Welles, Diary of Gideon Welles, Volume II, p. 122-123 (August 27, 1864). Gideon Welles, Diary of Gideon Welles, Volume II, p. 122 (August 27, 1864). Gideon Welles, Diary of Gideon Welles, Volume II, p. 142 (September 13, 1864). Gideon Welles, Diary of Gideon Welles, Volume II, p. 143 (September 14, 1864). Gideon Welles, Diary of Gideon Welles, Volume II, p. 153 (September 20, 1864). Abraham Lincoln Papers at the Library of Congress. Transcribed and Annotated by the Lincoln Studies Center, Knox College. Galesburg, Illinois. (Letter from William P. Dole to John P. Usher, February 20, 1864). Gideon Welles, Diary of Gideon Welles, Volume II, p. 175 (October 13, 1864). Chauncey M. Depew, My Memories of Eighty Years, p. 64-65.